Joe Satriani’s second studio album, 1987’s Surfing with the Alien, was a game changer for Instrumental rock. The album, which features such instro-guitar classics as “Always with Me, Always with You,” “Satch Boogie,” the stunning “Echo” and legendary title track, was a surprise hit in the U.S. In Australia, however, it even managed to break into the Top 10 when it dropped there the following year. Around that time, Satch appeared on a new music-TV program called Saturday Morning Live to promote the album. He also offered the show’s hosts an improv solo jam in its Sydney-based studios. Note that the clip below is brief. However, while it contains some cool closeup shots of early Satch in action, it also features a noteworthy appearance of a pre-JS Series Ibanez prototype guitar. Based around the 540R (Radius model), it appears to have some mismatched hardware and a Roadstar Series neck. 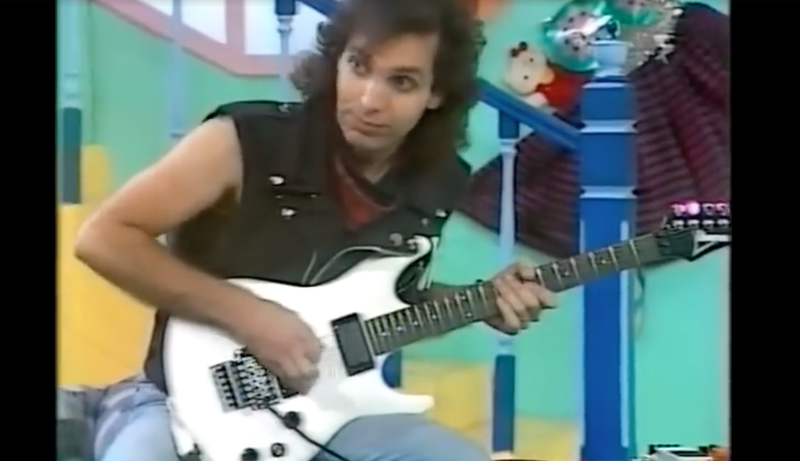 This was the only guitar Ibanez produced that was close enough to Satriani’s specs at the time. After almost three years of tweaking and refining, the final signature model wouldn’t be finished until the release of Satch’s followup album, 1989’s Flying in a Blue Dream. It can be seen as part of the album’s cover artwork.